Floyd County, Virginia - Preserving Tradition. Floyd is a county of small mountains, valleys, ridges and small streams. No water flows into the county; all sources of water arise within the county and flow out of the county's borders. Little River, the county's largest waterway is formed by three main branches, or forks: the East, West, and South (also known as Dodd's Creek) forks. The current County seat, originally named Jacksonville for the seventh president, Andrew Jackson (1829-1837), was completed in 1834. The town was incorporated in 1858 and its name was changed from Jacksonville to Floyd in 1896. Floyd County has a land area of 383 square miles and is located in the Blue Ridge province of the southwestern part of Virginia. 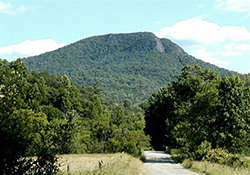 The county's terrain is rolling and the official elevation is 2,500 feet, Buffalo Mountain, at 3,971 feet, is the highest point in the county. The county is 60% forested. 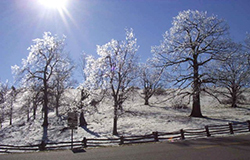 Thirty-one miles of the scenic Blue Ridge Parkway form the majority of the eastern border of the county. Rocky Knob on the Blue Ridge Parkway is noted for its rustic and rural landscape, plus great camping and hiking. It is an outdoor lovers' paradise with easy access to the Parkway's Mabry Mill and the Chateau Morrisette Winery. Mingle with the locals, see some terrific arts and crafts, and listen to some of the best bluegrass you'll ever hear. Floyd County truly is a sightseer's delight and photographer's paradise with the Blue Ridge Parkway's misty mountain views and miles of split-log fences. Town of Floyd is estimated at 432. The Town of Floyd is within an hour of Roanoke Virginia and 40 minutes to Virginia Tech in Blacksburg.